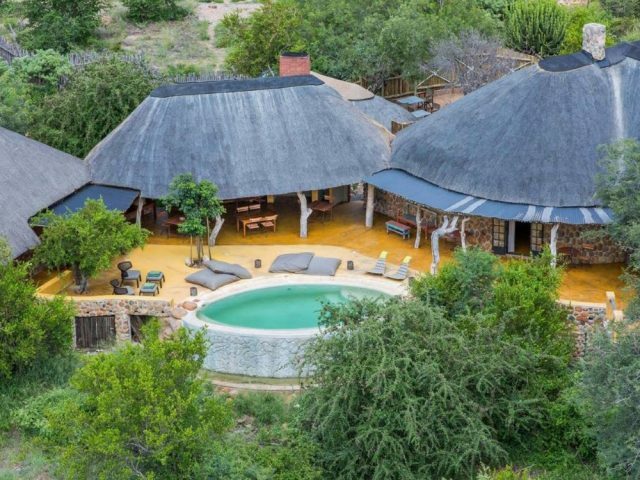 The perfect exclusive-use bush house overlooking an active waterhole in a prime Big Five area – ideal for that special gathering of friends or family! 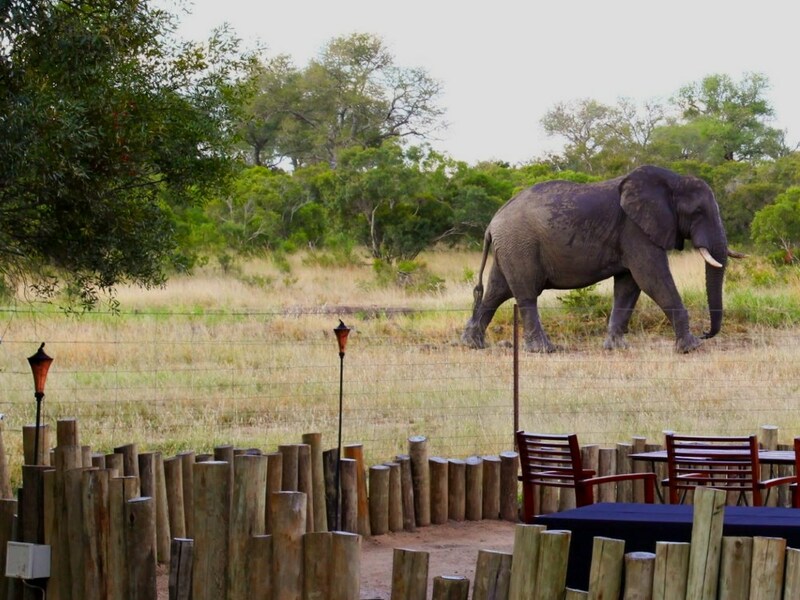 Enjoy a “Sofa Safari” as you relax on the shaded patio with your feet up whilst slumped on a couch, an ice-cold drink close to hand, as a steady stream of animals including herds of elephant and buffalo come down to drink at the very active waterhole in front of the house! Perfect for a holiday with family or a group of friends as it gives you the chance to really relax and make yourself at home. You don’t have to worry about other guests (so perfect for kids) and the warmth of the staff looking after your every need must be experienced to be believed! 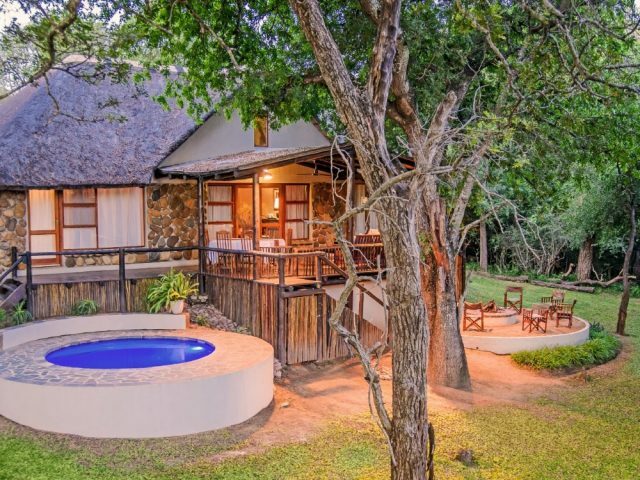 The location at first glance isn’t that attractive (especially compared to the forested river bank position of the Safari Lodge nearby) but the superb waterhole with its constant stream of visitors directly in front of the house more than makes up for that! In South Africa the number of houses that you can rent on an exclusive basis in a Big Five reserve is surprisingly small – and once you filter out all of those which only offer self-catering the number seriously dwindles even more! And let’s face it, many people have no desire whatsoever to go to the hassle of buying your own groceries and doing all the cooking and washing up themselves. That’s where Tintswalo’s Manor House really hits the right spot – you get all the privacy and exclusivity of having the use of a bush house all to yourself, yet it comes with your own dedicated butler and chef determined to deliver a top-notch culinary experience (and of course there’s also the small matter of having your own safari vehicle together with a dedicated ranger/tracker team) What’s not to like?!? The Manor House is located just a few minutes’ drive from Tintswalo’s luxurious Safari Lodge (incidentally one of our very favourite upmarket lodges of all!) but it has a completely different feel to its bigger brother. For one thing there’s the location: whilst the Safari Lodge is located on the shady banks of a dry riverbed, the Manor House is situated out on an open bush plain overlooking a small and very active waterhole. Relax on the shaded patio with your feet up whilst slumped on a couch, an ice-cold drink close to hand, and you’re set for the perfect “sofa safari” as a steady stream of animals including herds of elephant and buffalo come down to drink make for truly entrancing viewing. The other main difference compared to the Safari Lodge is in the style and level of luxury of the accommodation. Whilst the huge rooms at the Safari Lodge boast top-end luxury style and features, the thatch-roofed Manor House is a much more homely and down to earth affair (more 4 Star if you like) Whilst the bedding and amenities are Safari Lodge style top-notch standard, the style and size of the rooms are more modest. There are 3 en-suite bedrooms downstairs (of which one has an additional twin children’s room leading off it, the 2 also sharing a bathroom) Then there’s a gorgeous master-suite upstairs, clearly the biggest and nicest room and also enjoying a lovely deck overlooking the waterhole – this as we said is the pick of the rooms and good luck to you sorting out which of your group are going to crack the nod to be its lucky occupants! Tintswalo Manor House really sets up perfectly for spending many happy hours outside – apart from the deep shaded veranda area that we already mentioned, there’s also an inviting swimming pool complete with an adjoining cosy bar under thatch also overlooking the waterhole (closer to it in fact than the house itself) Then there’s the open boma/fire-pit area next to the perimeter fence and next to the waterhole where you’ll no doubt spend many hours chatting under the stars around the fireplace. Obviously being fenced off, the lawned grounds of the Manor House are perfect for kids to relax and enjoy themselves safe from the wildlife beyond. And if this isn’t relaxed enough for you already and you fancy a pampering massage, then you have access to the gorgeous Spa at the Safari Lodge to ease away any pesky nodules! Talking of the wildlife, we believe the Manyeleti reserve is one of South Africa’s best kept secrets! It’s sandwiched neatly between the unfenced Kruger National Park in the east and the Timbavati and Sabi Sand reserves in the north and south, yet it’s more open grassy plains arguably carry a higher density of plains games than those better known reserves. With all this plains game the predators are sure to follow, including excellent lion populations whilst we also enjoyed lovely cheetah sightings when we visited - and whilst the leopard sightings may not match up to the Sabi Sands, they are also regularly spotted. Big herds of elephant and buffalo also make for dramatic sightings. The even better news is that with just a small number of lodges in the reserve, the vehicle traffic is a lot lower than in the neighbouring reserves and you are often able to linger at sightings for as long as you wish. One of the beauties of staying at Manor House is that you get the use of your own safari vehicle, complete with your own dedicated ranger/tracker team. The Tintswalo guiding team are renowned for their quality and enthusiasm, so you’re likely to have a truly memorable wildlife experience. Obviously the good news is that, as it’s your exclusive use vehicle, you have more flexibility in terms of staying on sightings that interest you for as long as you like, having the kids along chatting away etc etc without having to be worried about disturbing any other guests. As we mentioned before, one of the main advantages is that the Manor House is fully catered so you don’t have the hassle-factor of trying to feed yourself. But more than this, Tintswalo is renowned for the quality of the dining experience and having your own private chef ratchets this up a notch if anything! 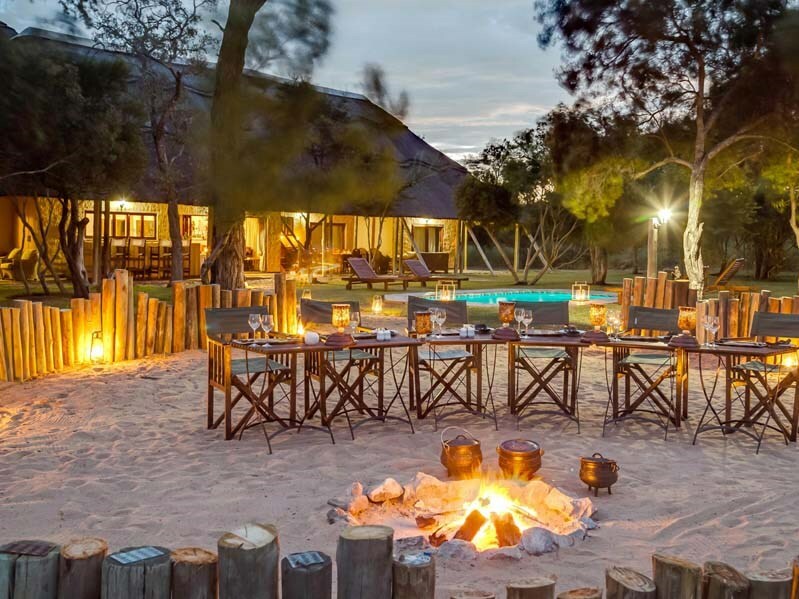 Guests at the Manor House almost unfailingly rave about the dining – both in terms of the quality of the food but also the imagination used to enhance the whole experience: don’t be surprised to be treated to things like a bush breakfast or a lamplit dinner out in a dry riverbed! Enjoy a family safari in your own exclusive-use house -this comfortable house is reasonably priced for a family safari - there are 2 downstairs bedrooms as well as an upstairs loft perfect for kids! Once the private home of Motswari’s owners, the Geiger family, this is a gorgeous little lodge of just 4 bedrooms that boasts intimacy, character and charm in spades!